By the year 2018, it is expected that over 25% of enterprise customers will adopt web-scale networking to build modern data centers. This rapid adoption can be attributed to businesses' increasing dependence on their data centers, while at the same time facing reduced IT budgets and limited staff to address their growing business needs. 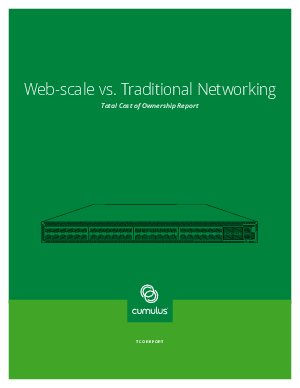 Fill out the form to download a TCO report on how organizations have saved an average of 45% on CapEx and approximately 74% on OpEx by adopting web-scale networking solutions from Cumulus Networks. You’ll learn how Cumulus modeled a real-life TCO calculator on the actual production path their customers took to build an agile, scalable, and cost-efficient data center.